North Tower Revealed | Flickr - Photo Sharing! Another shot from a couple nights ago (after this one). I decided to post this one next because a couple people drew attention to the unusual-looking shadows along the coast, which are more clearly defined in this shot. I took this shot a little later in the evening than the previous shot I took as the fog continued to clear revealing more of the bridge's north tower. The south tower really never managed to break out of the fog. As an aside, I don't normally wear a watch, but usually will to time nighttime exposures. I forgot it on this night so I had to find an alternate way to time my shots. 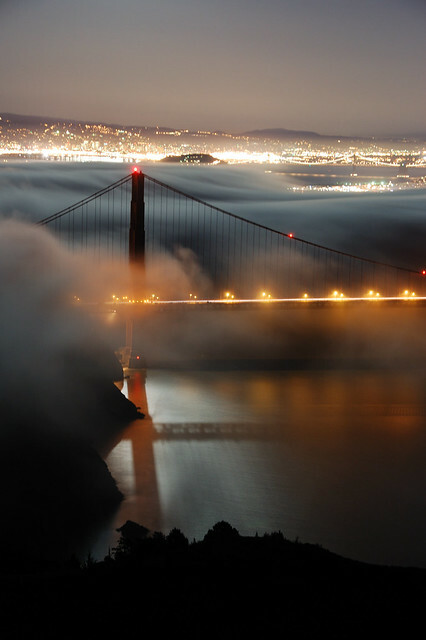 It turns out that among the foghorns in the bay (nor surprising they were blaring that night is it!) the deepest goes off every 20 seconds. So I mostly shot 40 second exposures, or more specifically, two foghorns. What a wonderful shot... nice POV! mi piacciono molto le tue foto, complimenti!!!! Beautiful shot. Just read your comment about the foghorns - brilliant! Nice to see a different angle of this scene. I love all the different colors in here. Fantastic image...the moon shadow is a great addition. Night is a wonderful time to take the camera out for a walk! Hi, I'm an admin for a group called Reflections and Fractions, and we'd love to have this added to the group! Hi, I'm an admin for a group called EnLighted & DeLighting Bridges of the World, and we'd love to have this added to the group! your seem to have amazing eye for bridge-scapes! wow this one is sooo amazing!!! Hi, I'm an admin for a group called California Photographers - Great California Photography , and we'd love to have this added to the group!